Happy New Year, dear readers! It’s been an amazing year in the board game industry for for publishers and gamers alike, with tons of new titles to explore including some awesome Greater Than Games hits like Fate of the Elder Gods, Spirit Island, Lazer Ryderz, and the Bottom of the 9th: Clubhouse Expansion. And there’s even more to look forward to in 2018 as our gargantuan project Legends of Sleepy Hollow and the Sentinels of the Multiverse RPG will be released! But before we look forward to next year, it’s time on Dice Hate Me to look back at some of the best and brightest board games from 2017. The categories are always tough to parse and come to a decision because of excellent games, and this year is no different. To clarify the process of selection, the Game of the Year Award is open only to those games that were published and distributed for retail openly in North America in 2017, and no Greater Than Games/Dice Hate Me Games titles are eligible. But, in order to honor those games that graced the gaming table for the first time this year but were published before 2017, I am continuing to announce the Dice Hate Me Discovery of the Year Award – including a certain title that will come as no surprise to all of you if you’ve been paying attention. All aboard! Every year I play so many games that are incredibly fun and well-deserving of praise; as such, there are often a plethora of titles that I could consider for my Game of the Year. But for me to truly pick just one title that stands out above the rest each year, that game has to not only be fun, but make me feel or experience a little something I hadn’t before. Some like to toss around the word unique, a word used so often that it sometimes loses meaning. And, so, I use the word unique here sincerely because there’s no other word more apt since Sol provides a gaming experience unlike any I’ve experienced before. A surface description of Sol certainly sets the story easily enough – the sun is going to explode, so you and other representatives of the human race need to harvest energy from the dying sun, transmit it to your Ark, and race out of the system before it goes supernova. That brief description, however, is the easiest thing to explain about Sol and how it plays. At its heart, it’s a race game, but to win that race you have to tactically manage your ever-growing or shrinking fleet of Sundivers across five levels of the Sun, either activating structures that build more Sundivers, harvest energy from the Sun, or transmit that energy to your Ark. All this while your mothership continually orbits, making your choices of releasing more Sundivers and guiding them even more wonderfully complex. If it sounds more complex than wonderful it’s because you simply have to experience this incredible, memorable, and extraordinarily beautiful labor of love from Ryan & Sean Spangler. Sol: Last Days of a Star is a game for 1-5 star voyagers, ages 10 and up, from Ryan & Sean Spangler for Elephant Laboratories. 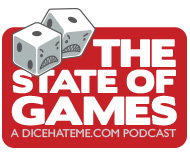 The dynamic design duo of Matt Riddle & Ben Pinchback are no strangers to those of you who’ve kept up with my Game of the Year lists over the years; their amazing Fleet took home the Dice Hate Me Game of the Year Award for 2012. And now their gargantuan effort for 2017, Wasteland Express Delivery Service, almost took home top honors this year. I had the pleasure of first playing Wasteland Express way back at Unpub 5 in February of 2015 when Matt & Ben invited me and Dan Patriss to try out a revamped version of their former game Space Vikings. There were some rough edges – it was an early prototype, after all – but it was clear to me then that there was not only charm in this conceit but fun, form, and substance. Of course, it didn’t hurt that it included post-apocalyptic truckers. I wished then that I was able to work on it with them, but Pandasaurus Games quickly snagged it up and Jonathan Gilmour deftly rounded out the design & development team. Two and a half years, and tons of plastic, punchboard, and incredible production quality items later, an incredibly immersive, utterly gonzo, amazingly fun pick-up-and-deliver game finally graced our game tables. It’s most certainly mad to the max, and it deserves to grace your personal Thunderdome. Wasteland Express Delivery Service is a game for 2-5 apocalypse truckers, ages 13 and up, from Ben Pinchback, Matt Riddle, and Jonathan Gilmour for Pandasaurus Games. Every couple of years a game is released that grows so enormous in hype that it dares you to ignore it; this year, that game was Gloomhaven, and the sheer mass of its hype was matched only by its gargantuan box, and crazy amount of content inside. Gloomhaven is the brain child of Isaac Childres, a soft-spoken designer from Indiana with a PhD in physics that had a dream and made it an incredibly successful reality on Kickstarter. On its massive surface, Gloomhaven could be best described as a dungeon crawler; players choose to play as one of several fantasy-based archetypes like a rogue, or spellcaster, or giant, smashy, fighty creature, and take those characters on grand adventures in and around the surrounds of the city of Gloomhaven. Like many other tabletop dungeon crawlers, there are scenarios laid out in a book that requires players to form a board with interlocking tiles and seed it with a series of nasty ne’er-do-wells, treasure chests, and traps for the adventurers to smash, unlock, and disarm, respectively. Where Gloomhaven shines above all those other similar dungeon-crawlers is in the story contained in a sprawling tome that could see the adventurers embark on several paths that provide different outcomes depending on their actions. This is not to mention the incredible number of sidequests that could keep players busy for weeks on end. With over 96 pages in the Gloomhaven quest book, this analog game rivals many digital RPGs, and has an unbelievably balanced AI and combat system that seamlessly scales according to the number of players. I’ll readily admit that dungeon crawling is not my preferred cup of tea – hokey religions and ancient weapons are no match for a good blaster at my side – but the sheer audacity of scope and charming approachability of Gloomhaven makes me want to don my cloak and continue to steal all the gold from my fellow adventurers time and time again. 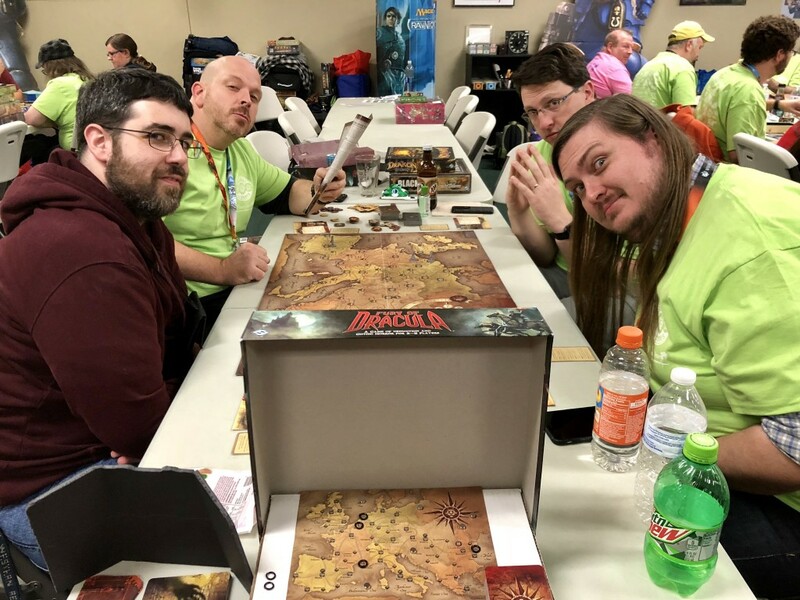 Gloomhaven is a game for 1-4 adventurers, ages 12 and up, from Isaac Childres for Cephalofair Games. Pulsar 2849 (a truly fantastic late year Euro release from Czech Games Edition by Vladimir Suchy that missed the top 3 list only because Gloomhaven is such a juggernaut), Lisboa (another juggernaut, this chunky Euro from Vital Lacerda is larger than life, both in gameplay and in box size), and Sentient (a surprise sleeper hit from J. Alex Kevern and Renegade Games that is both charming and challenging). Some years I’ll plow through a ton of games and many of them will be memorable and I’ll sit around at the end of the year and hem and haw for hours about which one did this the best and what had awesome art and what might do the things I like and which might deserve mention — and then there are a few, select times when I sit down at one specific game and, halfway through my first play, I can feel it deep in my gamer soul: “It just isn’t going to get any better than this.” And thus it was with First Class. The story of how I randomly came across this incredibly unassuming game in my local game store – as well as an in-depth review of this amazing title – can be found in this DHM blog post from June. To summarize, I sometimes feel like I didn’t just find this title as much as it called out to me from the shelf, and, over 10 plays later, I am still madly in love. First Class joins the echelon of games that almost transcend my A-Team shelves – the few, the proud, like Yspahan, and Fleet, and that under-appreciated gem Homesteaders. 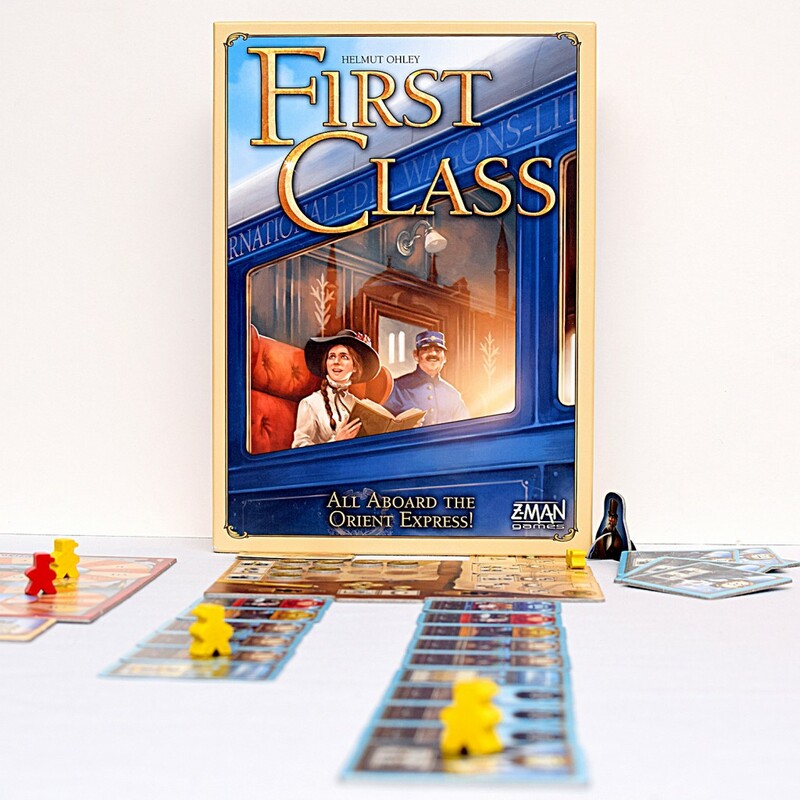 If you haven’t heeded my advice from the many mentions of First Class over the past year on Dice Hate Me and on The State of Games, heed it now: find First Class and join the rest of us on this classy ride. To say I like hidden movement games would be akin to saying I only casually like bratwurst or southern barbecue or a refreshing glass of Jameson; in other words, I freaking love hidden movement games. In this particular hidden movement game, one person takes on the role of the titular count, hiding out somewhere in Victorian Europe. The other players take on the roles of the vampire hunters – Mina Harking, Van Helsing, and the like. Dracula uses a set of location cards and crazy powers like turning into a bat to secretly maneuver around Europe while the hunters equip themselves and set out to find the count and make him deader than undead. Letters from Whitechapel is one of my all-time favorite hidden movement games, but it’s often a bit too complex and long-winded for the casual gamer. And, so, I’m here to say that if Letters from Whitechapel seems daunting, it might be best to put a stake directly in the heart of Fury of Dracula as it’s 5+ hours of pure, complex, white-knuckle gaming. But for those of you who love a great challenge and have the patience, Fury of Dracula will reward you with an incredibly immersive gaming experience, guaranteed to get your blood pumping. How perfect. For anyone who knows me well, it might come as a surprise that a Reiner Knizia title would make the top three in Discoveries of the Year but I have a general rule with the good doctor’s games: If it involves bidding or betting in any way, shape, or form, I’m generally all in. I also happen to be a sucker for games about horse racing. And, so, here were are, with me championing Winner’s Circle. 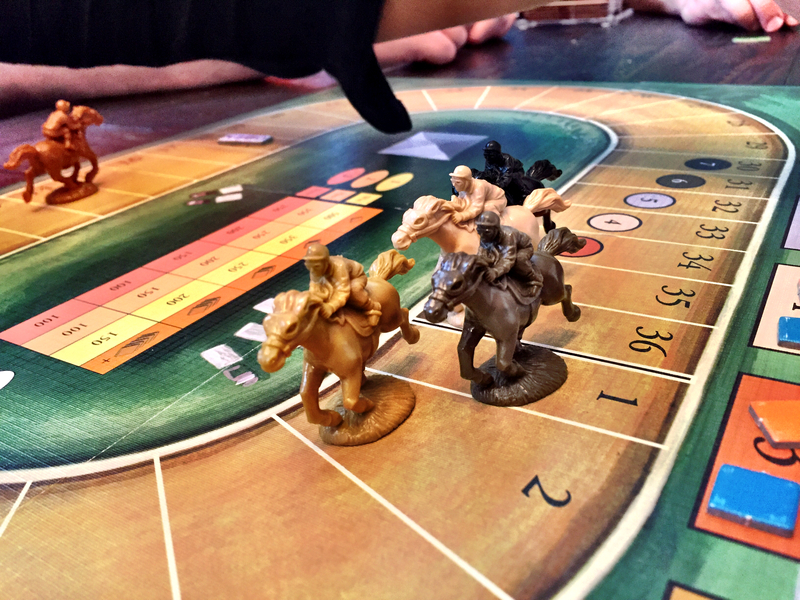 There are quite a few horse racing games out there that I genuinely enjoy – Horse Fever and Mint Julep being two prime examples – but Winner’s Circle does what the best of Dr. Knizia’s games do and distills the essence of its subject to a very simple structure that allows the players to add the complexity through interactivity, bluffing, and, quite often, collusion. Winner’s Circle is easy to describe: each race, players put down three bidding chits on horses – the chits ranked 0, 1, and 2, which indicates, respectively, a bluff (zero payout), equal payout, and double payout. Then they continue to roll a die with symbols that match movement values on the different horses until winners are determined. Some horses have huge sprinting values on a couple of symbols, while others are more balanced. And like any horse race, there are some horses that are surer bets than others – but you could always lose everything betting on a sure thing when some flighty filly defies all odds and jets across the finish line! Winner’s Circle is easy to play and great with large groups who like to hoop, holler, and taunt – all in good nature, of course. Grab a copy when you can find it! Ulm (a wonderfully chill little Euro with a suprisingly-satisfying tile action selection mechanism), Lorenzo il Magnifico (everything Grand Austria Hotel should have been and so much more), and Railroad Revolution (yet another easy to play but satisfyingly deep Euro release from the powerhouse publisher What’s Your Game? ).